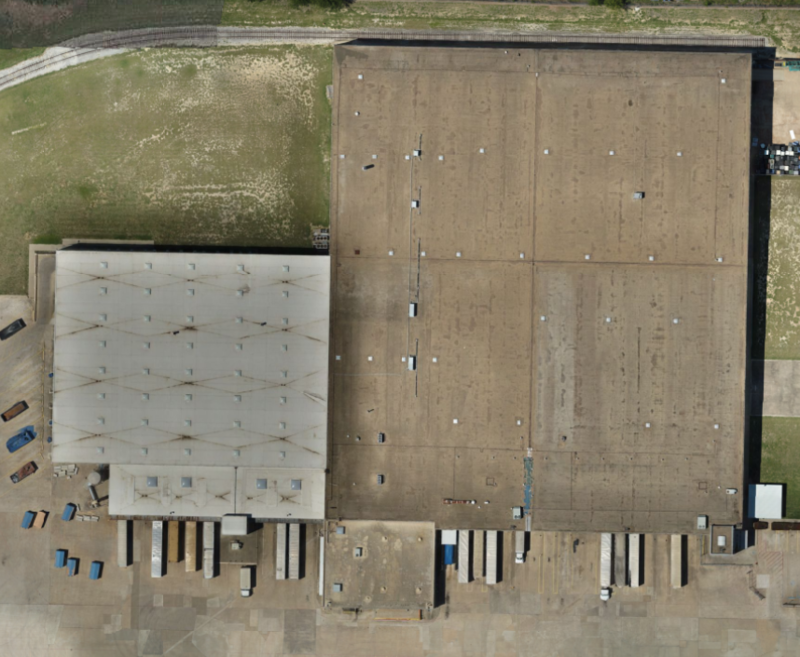 This is roughly a 220,000 square foot roof located in Mesquite, TX. 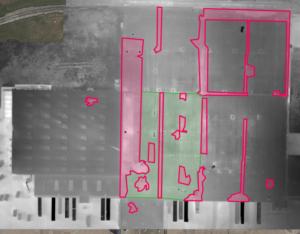 About 160,000 square feet is a modified bitumen roof that had the gravel aggregate removed for inspection purposes. 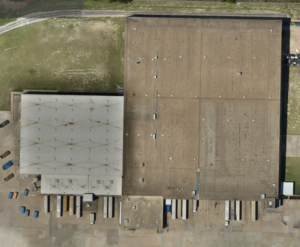 The other 60,000 square foot of the roof was a fully adhered TPO roof. We were brought in by Quick Roofing to assess the roofs condition as the client wanted to pursue installation of a second roof system over the current one. Quick Roofing was doing the right thing by making sure they didn’t trap a lot of moisture in the roof before covering it up. The Mod Bit roof was comprised of a standard construction with roof insulation, roof board, a base sheet and cap sheet. The age of the roof is unknown. The TPO roof system was fully adhered and is much newer. Our job on this project was to identify where suspected moisture was and provide measurements and calculations as to its size and location on the roof for further testing to confirm its presence. 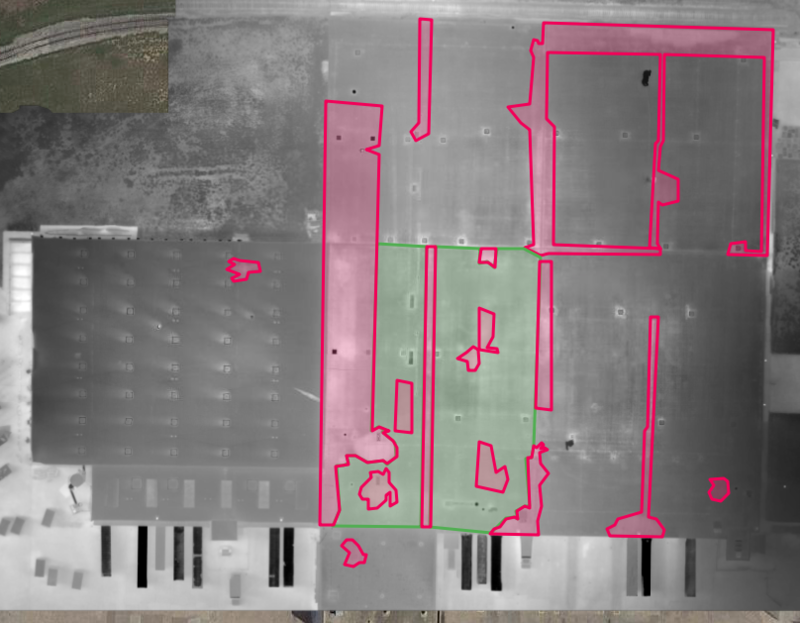 We captured aerial visible and thermal images of the roof for processing and detailed reporting. 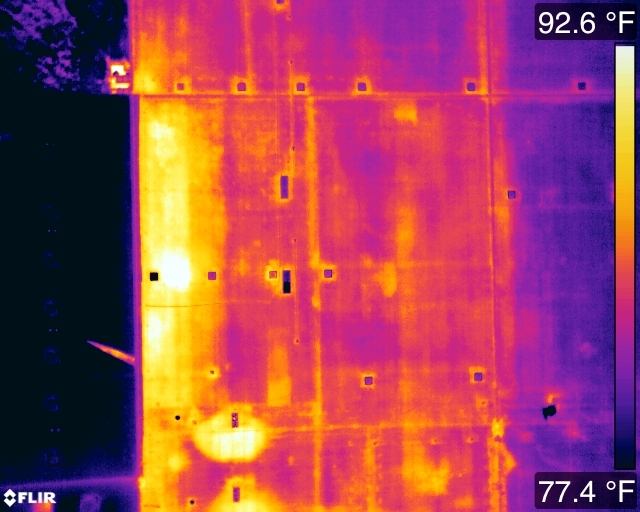 We identified nearly 60,000 square feet of suspected moisture within this roof system. Even though the roofing company was hoping they would get a dry roof system, they are taking steps to remediate the wet portions of the roof as to not trap moisture in the roof system, which could cause long term unwanted harm to the building and ends up being in the best interest of the client. We provided square footage calculations of each area located and put measurements in to help them locate those areas. 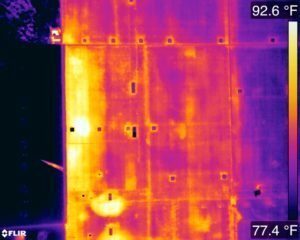 The roofing company then went back to do core studies on the areas of suspected moisture to confirm its presence in those locations. Our detailed reporting process pointed the roofing company to the exact locations they needed to perform tests for moisture. They were able to take confirm the presence of moisture in the areas highlighted here rather than blindly testing areas for moisture. We also provided them with the detail needed to remediate all the suspected moisture within the roof rather than just guessing what needs to be removed before a new roof system can be installed over the existing one. The property owner made a great decision! If this moisture was trapped in the roof system for the next 10- 15 years, it could have negative effects on the lifetime of the building. To learn more about how Tarillo Vue can help you determine the present condition of a roof and gather useful data, then give us a call today at (214) 842-6000!